Our Passenger Drift Hot Lap Experience enables you to sit shotgun next to our pro drifter for 4 insane sideways hot laps linking up our dedicated drift circuit. 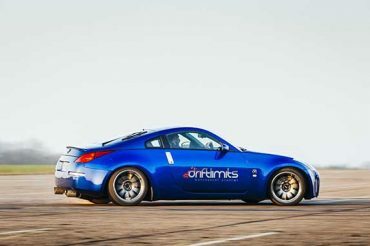 You will be strapped into a fully prepared Nissan 350z drift car and chucked lock to lock as you are pinned to the side of the seat – our guests usual reaction? Uncontrollable giggles of excitement, smiling around the entire circuit as we leave huge thick lines of black burning rubber and a cloud of smoke trailing behind us. Expect adrenaline, dramatic entries and high speed clipping points. This art form of motorsport first originated in Japan is one of the most spectacular and ridiculously fun!